In 1941, a knight from King Arthur's court was pulled into the future, where he became the hero known as Shining Knight. When he and the rest of the Seven Soldiers of Victory were lost in time, they were rescued by the combined efforts of the JSA and the JLA, including Batman. That'll be important later. Anyway, during WWII, Shining Knight took a squire, Percy Sheldrake. When he became an adult, Percy took the name Knight and, inspired by Batman (there he is again), had his own son Cyril as his sidekick. When Percy was killed in action, Cyril became the new Knight and acquired a Squire of his own, and started fighting crime... alongside Batman. So in the time Batman's been active, three generations of Knights and Squires have come and gone. Welcome to the wonderful world of comicbook time! After Sir Percy died, Cyril lost most of the family fortune to drugs, gambling and alcohol. It was Baryl Hutchinson, the new Squire, who helped him turn his life around. He joined the international government-sponsored team known as the Ultramarine Corps (which was sort of a bad idea) and hung out with the International Club of Heroes (which was sort of even worse). Now he's Great Britain's representative of Batman Inc., and so far that seems to be going fairly well for him. Nothing else ever got him an action figure, for instance! 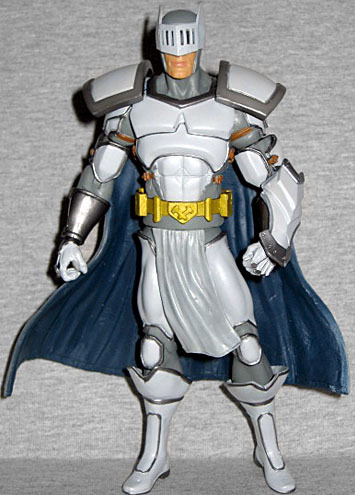 Knight was sculpted by Mike Locascio, but he doesn't seem to be wearing any armor he's worn in the comics. It's similar, sure, but it's more built-up now, more square and more covering. But who cares? It doesn't need to duplicate the comics' art to look good, and it does look good. Knight is standing with his weight on his right foot, and the way his loincloth hangs suggests he just shifted that direction. 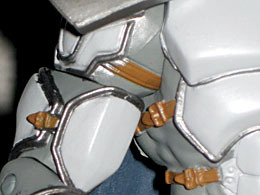 The sculpt manages to convey the idea of "pieces of armor over a body" rather than just "designs on a costume": the armored bits rise up from the suit beneath them far enough to look separate, which is something that's often overlooked. The shape of the armor is rather blocky, so you can easily tell this isn't just a cloth costume (or even "armor" like Batman wears). He has large square shoulder pads, flares at the top of his boots, and a crossed hammer logo on the buckle of his utility belt. There's an armored plate on the left forearm, but some kind of digital control panel on the right. Don't overlook the small details, either, like the straps holding the armor on, or the brass knuckles built into his gloves. Knight's helmet is what really sells his connection to Batman. He has a typical visor, with horizontal slits for him to see out of, but the sides look unmistakably like bat ears. Or should that be Bat ears? We'd like to credit the design to Ed McGuinness, since he was the first one to make it look good, but the fact is Howard Porter is the one who came up with it. The paint is good, but there are areas of spillage and incomplete coverage that can't be ignored. Of course, there are so many small details and thin lines that it would be almost impossible not to have those, unless each figure was hand-painted over a period of days. Unless the figure is within a foot of your eyes, you're not going to notice the flaws. 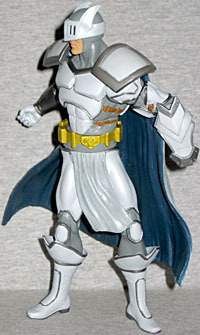 What you will notice is how poseable the Knight is. He has a balljointed head, swivel/hinge shoulders, swivel biceps, hinged elbows, swivel wrists, swivel boots, hinged knees, swivel hips and, amazingly, a waist! That's almost as good as a DCUC figure. The shoulder pads limit the range of the arms somewhat, and the armor on the thighs bumps into the waist, but it's not terrible. Honestly, the biggest drawback about the articulation is that he doesn't have any accessories to take advantage of it. 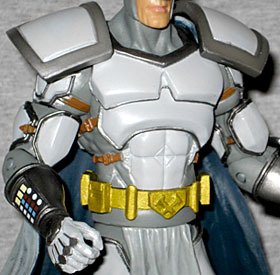 No, Knight doesn't use batarangs or anything, but how about a sword or some of his non-lethal guns? Something he can hold in that open right hand. Knight isn't a perfect representation of the character seen in the comics, but he's close. And more than that, he has no competition: there's never been a Knight figure before, and it's not likely there will be one again. But even if this isn't a panel of art that's been brought to life in three dimensions, the "feel" of the character is intact, and the actual execution of the toy is very good. But come on now, DC: we need a Squire to go with him.